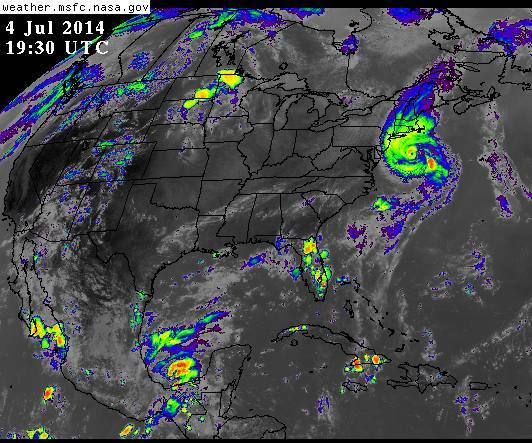 Back on 20 August we posted comments about Hurricane Alley Traffic, and in 22 August we posted Beware of the Tropics!. Today on 25 August 2010 we see several of the concerns expressed in those postings becoming real hazards. 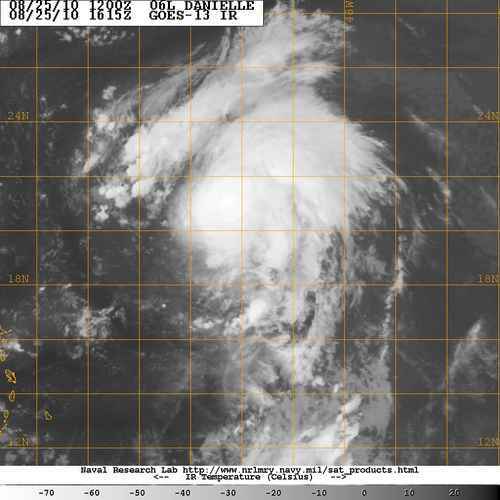 What was then Tropical Depression #6 is now Hurricane Daniellein the middle of the tropical north Atlantic following a track that may keep it away from land as it recurbs toward the north and eventually the northeast. The large tropical wave we alerted about as it emerged from equatorial Africa, over the warm waters of the eastern Atlantic south of the Cape Verde Islands, is now Tropical Depression #7 riding along ‘hurricane alley’ on what appears, at least for now, a more westerly track than Danielle followed before, which could spell potential trouble ahead for Caribbean nations and even South Florida or the mid-Atlantic mainland USA a few days from today. Global mosaic, a composite of several satellite images, showing the Atlantic and Indian oceans, and a portion of the eastern Pacific. Two hurricane, one tropical depression and several tropical waves are visible in this view. 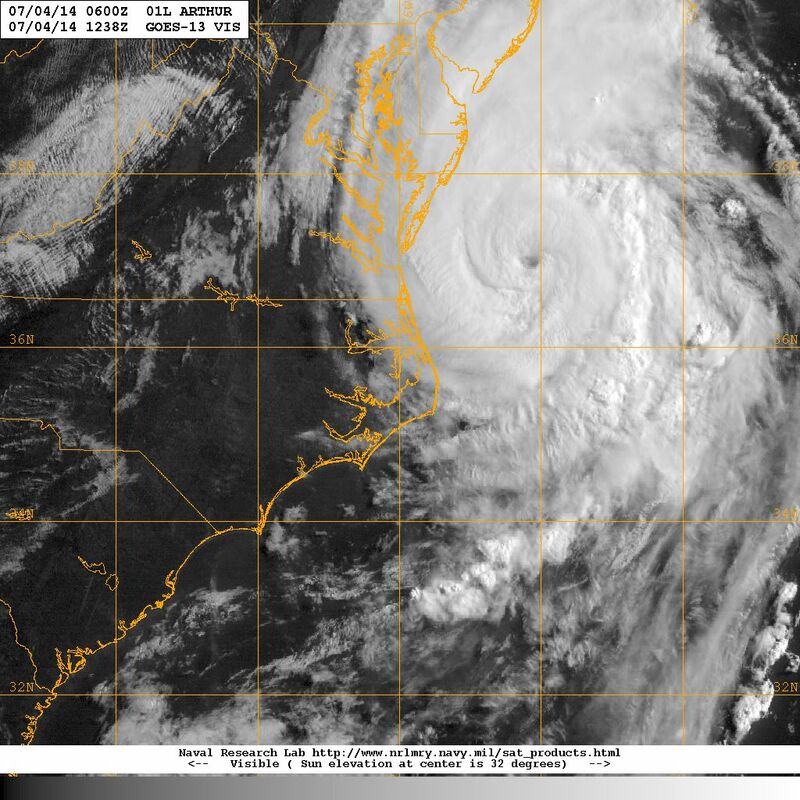 Here we see both 'hurricane alley' and the 'tropical wave assembly line' in action. As if Danielle and TD #7 were not enough, there is already another quite large tropical wave just now coming over the eastern Atlantic waters south of the Cape Verdes, and a couple more tropical waves following behind it at regularly spaced intervals. 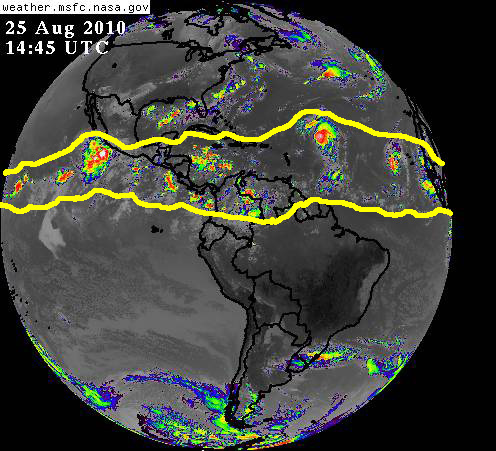 What we are seeing is the tropical wave assembly line in equatorial Africa kicking into a higher gear generating tropical waves, fueled by the heat and high moisture content in the atmosphere and trade winds pushing storms westward over Africa from the Indian ocean. Composite full-disk satellite view of Earth's western hemisphere showing the belt of tropical weather circling the planet just north of the equator. While this is in progress we must take a look at the eastern Pacific just south of the equator off the coasts of Peru and Ecuador, where surface waters have temperatures averaging 15 degrees Celsius with even colder surface waters nearer the land. What we are seeing is a typical La Nina event, part of the Pacific ocean ENSO (El Nino Southern Oscillation) phenomenon, which traditionally creates a favorable environment for tropical cyclone generation (cyclogenesis) over the tropical north Atlantic ocean. How much will the current La Nina contribute to hurricane development in the Atlantic depends on several other factors and remains to be seen. However, the mere fact of an unfolding La Nina combining with all the tropical activity already being generated in the Indian ocean, over equatorial Africa and along hurricane alley in the Atlantic, should sound the alert for all of us who reside along the coastal regions of the Western Atlantic, the Caribbean and the Gulf, to pay attention, be prepared, and to always practice MITIGATION. Relative to this it is critical that we all keep in mind that there is no such a thing as just a minor hurricane, every hurricane is capable of causing plenty of damage on building, infrastructure and property, and when it comes to a major hurricane (category 3 or higher on the Safir-Simpson scale) all it takes is one making landfall over a vulnerable community to cause major damage or even a disaster. 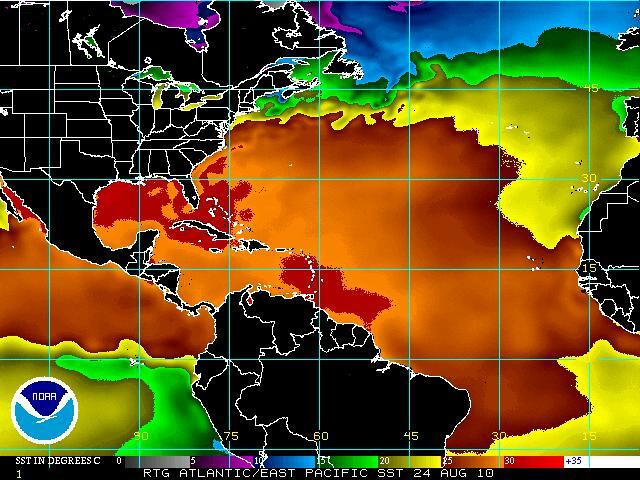 Map showing sea surface water temperature in the Atlantic, Caribbean, Gulf and eastern Pacific basins. The darker shades of brown in the Gulf and southeast of the Caribbean identify waters above 30 deg. Celsius. The green colors and a touch of blue off the coast of Peru shown the much cooler waters marking the unfolding La Nina event.